Note for LDD users:\nLDD has two versions of part "Plate Special 1 x 1 with Clip Vertical" ("Plate 1x1 w. Holder" in LDD), but their IDs inside the program do not match the IDs used everywhere else. 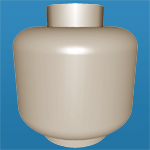 Currently LDD part 60897 is being imported to Rebrickable entry 60897 (Thick Open O Clip). However, judging by its appearance in LDD, it should be changed to Rebrickable entry 4085b (Thin U Clip). You have to do it manually. LDD part 4085 is being imported to Rebrickable entry 4085c (Thick U Clip) which is quite correct. However, if you prefer to use the most recent mold variation in your MOC, you should change it to Rebrickable entry 60897 (Thick Open O Clip). Click on a colored part below to see the Sets and MOCs that use part 4085c Plate Special 1 x 1 with Clip Vertical [Thick U Clip] in that color. You can find an overview of all LEGO Colors here. The color Reddish Brown already exists for this part. To add the element number, I need to know in which official set it was used. MOC-1631 was a LEGO Ideas project that did not have enough supporters. It includes the Reddish Brown 4085c as a color error. I also looked at all the sources of information rebrickable relies on for making additions to the database. While there appear to be some for sale, they are not listed in an official set at the moment, nor have I seen a verified alternate source. There are 5 Mold variations of part 4085c - Plate Special 1 x 1 with Clip Vertical [Thick U Clip] in the database, in use between 1990 to 2019. See Molds and other related Parts.